What better way to stimulate a curiosity for science than imagining all the ways the universe could kill our planet? The vocabulary is best suited to upper elementary, if not middle school, and the science is reasonably solid. Intended more for a middle-school audience, this is an illustrated list of 7 possible ways a planet like Earth could be destroyed. It includes a table of contents and index. Many of the 7 "ways" are collision-based, but there is also a topic on the sun's expansion, wandering black holes, and one on invading alien potential. The material includes measurements in both metric and imperial and is laid out similar to a simplified National Geographic article. The illustrations are interesting and there's a section about the illustrator and his process at the back. Anything you didn’t like about it? The matter-of-fact science language is often co-opted by interjections attempting to make it "interesting" which just felt jarring. Also? Don't give this to young ones that you're attempting to CALM from any fears of Earth's destruction; many of the 7 topics end with some variant of "It's not likely...but you never know so keep your eye out!!" Not very calming...To whom would you recommend this book? Recommend especially to those who like a good scare or who are curious about potential outer space tragedies.FTC Disclosure: The Publisher provided me with a copy of this book to provide an honest review. No goody bags, sponsorship, “material connections,” or bribes were exchanged for my review. I cringed a bit when I first saw this book - great pictures, but lots of tiny words. Instead of being a tedious scientific explanation sprinkled with conjecture and speculation, it was cleverly written and even entertaining. Yes, there is science and some speculation, but it is given in a way that makes you want to learn more. I especially enjoyed the section on black holes, those dark mysteries of space. I did not know that in 2014 an asteroid hit Russia that "released the explosive equivalent of 500,000 tons of TNT"! I would recommend this book to everyone, but especially those fascinated with space. Entertaining but more of a cartoon than a book. Clearly geared toward middle schoolers worried about asteroids and aliens. The author shares how he created and photo-shopped the images, which are pretty cool. I gave it 3 stars because it was fun to read, upbeat, and thought provoking; but don't expect too much here in the way of hard science. Who wouldn't want to read about all the ways our planet could be destroyed?! 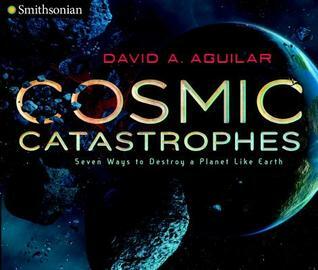 This nonfiction book on all things space and detrimental to our planet, also identifies that these catastrophes are VERY unlikely to happen, but it's still interesting to read about...and know this is what a lot of films are based on. Great read with wonderful illustrations. I like how it takes evidence of past catastrophic events in the universe and applies them to earth's possible future.